Wait for the bus to arrive and come to a complete stop. Watch for the red flashing lights and the stop sign arm to be extended. If you have to cross the street to get to the bus, cross only when all traffic on the road has stopped, and only when you have looked left, right and left again. Go directly to a seat (you can High Five your friends when you get to school). Stay seated and facing forward. It’s OK to talk with friends, but keep the noise level down to avoid distracting the driver. If you have to talk to the driver about something, you should wait for the bus to stop, and then get the driver’s attention by raising your hand and calling his or her name. Do not throw things on the bus. Keep your hands, heads and other objects inside the bus at all times – Do not play on or around the windows. Keep the aisle clear and the emergency exit accessible. Follow the bus driver’s directions at all times. Wait until the bus comes to a stop before getting out of your seat. Walk, don’t run, to the door. Wait behind the yellow line until the driver opens the door. Don’t push or try to rush out. 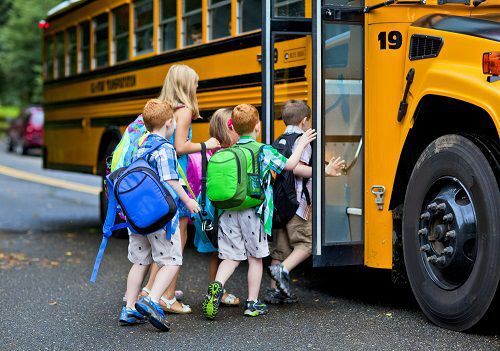 Walk straight off the bus at least 3 or more steps from the door before changing direction. Stay away from the bus wheels. If you need to cross the street, watch out for other vehicles. If you accidentally left something on the bus, do not return to the bus to get it, because the bus driver might not see you and may have already begun to move the bus. If you drop something when getting off the bus, tell the bus driver so he or she does not move the bus while you are picking it up. Only get off the bus at your stop. If you need to get off the bus at another stop, you should have a note from your parents.